Cor, Taylor and Caitlyn have put an end to The Creeper's reign of terror, but at what cost? The teens' lives are thrust deeper into turmoil as Detectives Tolliver and Orlovsky keep Cor under surveillance; Caitlyn copes with her transformation, and Taylor sets off a cataclysmic chain of events that will tragically change their lives forever. 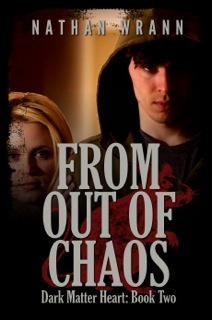 "From Out of Chaos is Book 2 in the "Dark Matter Heart" Trilogy. From Out of Chaos is definitely much different than Dark Matter Heart. It was still straight to the point and thrilling, but it was chaotic (haha title pun) and even depressing. I almost felt like maybe Nathan Wrann was in a depressive stupor and just said, "to hell with these characters" lol. This time instead of outside factors creating the trouble or even the bad guys it was the good guys causing their own trouble by just making dumb mistakes. I will admit that I understand Taylor's terrible choice. He was curious and he is a scientist so I understand how that happened, but at the end Caitlyn's terrible idea was just unforgivable. I literally wanted to reach in the book and kill her. Also a terrible event happens and if you read this novel you will know exactly what terrible event I am talking about, but the way that Cor responds emotionally just doesn't sit well with me. I know everyone behaves differently in those situations, but still I thought he should have reacted someway. I am just glad he didn't respond with anger. I also don't know how I feel about Wednesday (Diana). I guess I will just have to see how her character builds up (hopefully) in book three. I don't know if she will make an appearance, but hopefully she will because I love romance. I still definitely liked the overall story, but I did hate how Caitlyn's character behaves. I mean she is a very smart girl, but ever since she turned into a Vampire she has made really dumb decisions. She makes no sense to me and I just honestly don't like her character anymore. Taylor and Cor need to lose her. I did like From Out of Chaos, but not as much as I liked Dark Matter Heart. I didn't like that it was the good characters that caused the chaos and not the bad guys. It's one thing when you cannot control the bad things that happen to you, but its another thing when you cause them. I will definitely continue on with this series, because I want to see where it goes and I want to see how Cor and his friends are going to clean up the huge mess that was left behind in book 2. I haven't read the first book in this series, but your review has me curious even though you didn't like this as much as the first, its encouraging to hear you are looking forward to book three. Thanks for sharing this.